My name is Aline Brodin and I am very pleased to be back at LHSA to work on the project “Cataloguing Norman Dott's neurosurgical case notes (1920-1960)” until the end of July 2016. Indeed, I have started working as Project Cataloguing Archivist at LHSA on Monday 25th January, but I am already familiar with both LHSA and the Norman Dott project since I did a 10-week CRC internship from April to June 2015, during which I catalogued the Norman Dott case notes. This very enriching experience enabled me to develop my cataloguing skills and to gain good knowledge of the historical and administrative context of the project. Aline working on a case note. I trust that these cataloguing skills will enable me to see my task through to completion, all the more so that thanks to this internship I am already familiar with the content of the case notes themselves, including their specialised medical jargon and very technical documents. However, my objectives as an intern and my objectives as a project cataloguing archivist are somewhat different. Indeed, although my time during the internship was mainly focused on the Norman Dott project, my supervisors Ruth Honeybone and Louise Williams made sure I acquired lots of experience in a wide range of archival activities to help my future career. But this cataloguing post is in a way more challenging and is entirely focused on cataloguing the Norman Dott case notes: indeed, the project is coming to an end and the deadline is rapidly approaching. Thus, I have six months to finish cataloguing between 3267 (low estimate) and 4267 (high estimate) case notes, which represents an average of 35 per day. Case notes can be more or less detailed: some relate to cases spanning on several years and contain all kinds of handwritten notes, reports, charts, letters, photographs etc., while others can consist in a typed case summary of one single page. For each case note, I record carefully selected information that I then enter into the XML editor oXygen to create, eventually, an online catalogue. The recorded information is designed to be useful for future researchers whilst protecting patient confidentiality. A typical case file from Norman Dott’s collection (our reference LHB40 CC/2/PR3.2121). Identifying details have been removed. 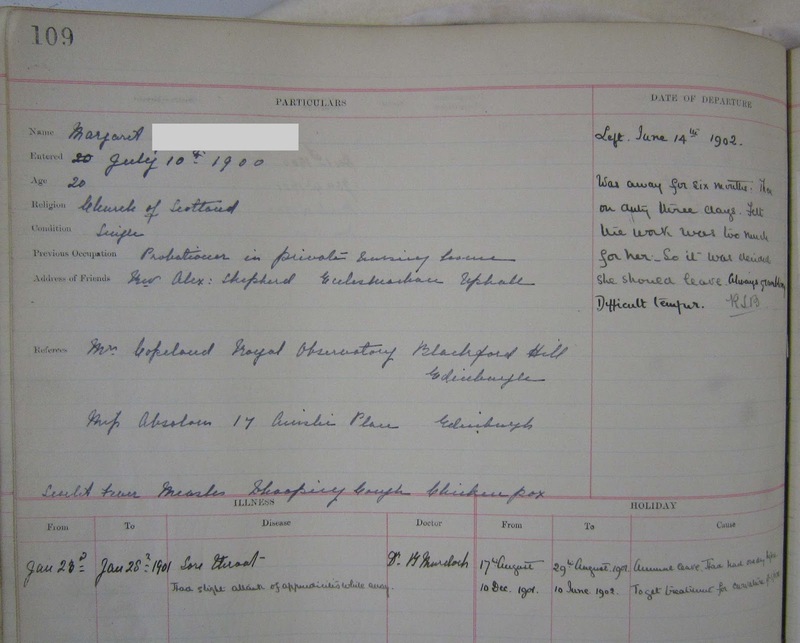 During my internship, I was cataloguing the Bangour series, that is to say the case notes from the Brain Injuries Unit in Bangour General Emergency Service Hospital in Broxburn, dating from c. 1939-c. 1945, in the midst of the Second World War. This time, I will be cataloguing the series LHB1 CC/24 and LHB1 CC/22. 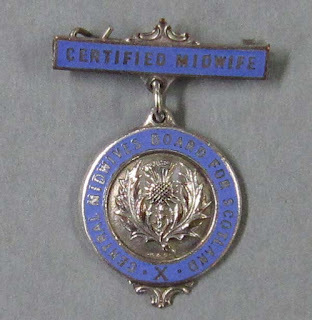 LHB1 CC/24 covers Dott’s work at the Royal Infirmary of Edinburgh between c. 1941 and c. 1959, whereas LHB1 CC/22 covers case notes from various stages in Dott’s career that have been filed by the condition of the patient and that date from c. 1925 to c. 1955. 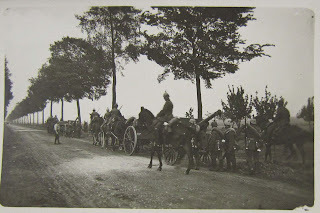 The differences between the Bangour series and the ones I am cataloguing now are not very substantial; the most noticeable change would be that in the Bangour series the patients are mostly soldiers or military auxiliaries, whereas in the R.I.E series they are almost exclusively civilians. Therefore, not only are there much more women and children, but there also are more “everyday life” accidents: for example, head injuries tend to be more the results of car accidents and kids bickering rather than gunshots or explosions… But in both cases, the case notes give a very interesting insight into a period and into people’s lives. 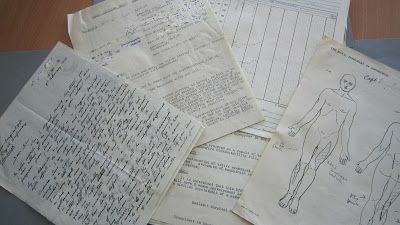 The Norman Dott project is a large-scale project that has involved many people over the years and that will greatly help to make LHSA collections visible and accessible; this is why I am very excited to take up the challenge to finish cataloguing this great collection, this time not as intern but as a project cataloguing archivist. My name is Alice Doyle and I’m just coming to the end of my first week here in the brand new role of Access Officer. I’m originally from Suffolk on the south-east coast of England, and first came to Scotland in 2008 to study Classical Civilisation at the University of Glasgow. 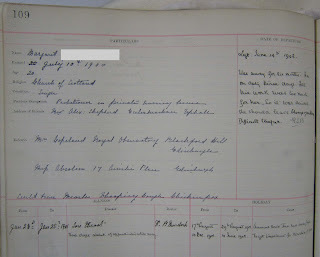 I suffered my first bout of ‘archive fever’ when I worked as a volunteer researcher for Ipswich Museum’s Ipswich at War exhibition, and I absolutely loved poring over registers of evacuees and tracing their subsequent movements across Suffolk. I was fascinated by how aspects of an individual’s life can find their way onto the pages of a dusty tome, and in how many ways this collected information can consequently illuminate our views of society past and present. During my undergraduate degree I secured a brief placement with the University of Glasgow Archive Services, which introduced me to the basic tenets of archival practice. I knew then that the bug had well and truly bitten me, and in November 2015 I completed an MSc in Information Management and Preservation. My first week has involved trying not to get lost in the maze of corridors, getting an insight into what everyone does and how the services fit together, and trying desperately to remember lots of names! I’ve also had an introduction to the stores and collections, and on Wednesday I had the chance to help Louise set up a session for some History undergraduates. This was to familiarise them with the basics of archival research and how primary sources can be used. After a bit of guidance on how to handle archival items, Louise introduced the students to four different types of material that can shine a light on perceptions of insanity in the Victorian age: letters written by patients at the Royal Edinburgh Asylum; the Morningside Mirror, which contains articles compiled and published by patients and staff; a book of press cuttings, often compiled by staff, of articles relating to the treatment and attitudes surrounding mental health; and patient certification papers, which give us an insight into how an individual could come to be admitted into the asylum. 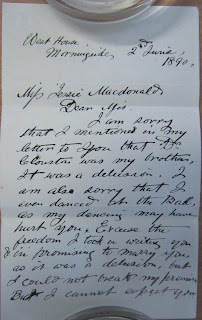 This session also brought home how varied the items in the collections are, and how personal some of them can be. 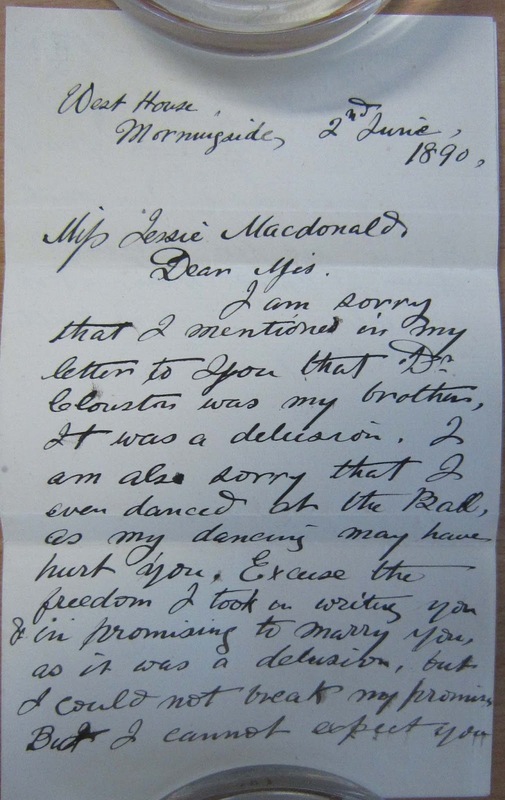 A particular favourite of mine was this letter written by a patient to a woman ‘on the outside’, in which he apologises for promising to marry her, and for dancing at a ball “as my dancing may have hurt you”. 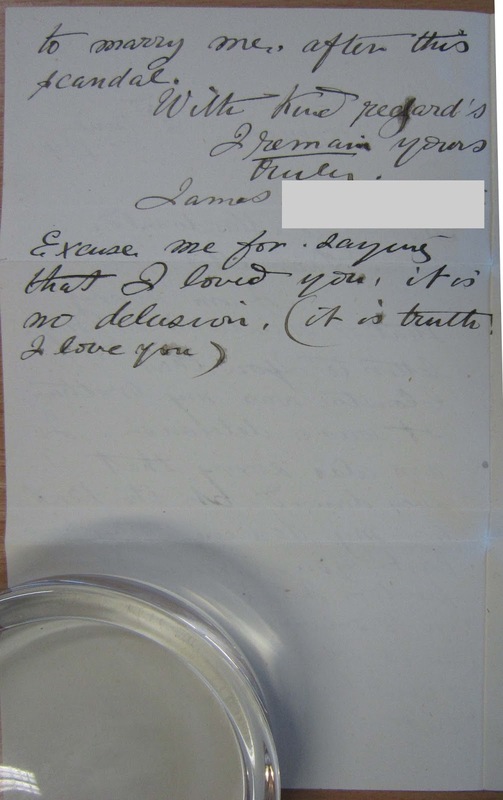 Cognizant of his illness, he acknowledges that his promise was a delusion but affirms his love for her as “no delusion, (it is truth I love you)”. This human aspect to archival work reminds us that - while they may seem like one among many - each name on the lists of admitted patients represents an important and very personal moment in these individuals’ lives. I’m incredibly grateful for all the support and guidance I’ve received from the staff here in LHSA and in the wider Centre for Research Collections teams, and I’m looking forward to learning more about how I can help to increase user access to and awareness of the fascinating collections held here, whether that’s through responding to enquiries, conducting archival research or helping out with organising engagement and outreach activities. As the old year passes and the new one comes in, we’ve a host of behind-the-scenes tasks to complete here at LHSA. It’s a bit of a frantic welcoming-in to each January, but it’s vital if we’re to be in good shape for the year ahead. Every new collection that reaches us has its own story: sometimes, a hospital building is closing and staff contact us with important records that reflect that institution’s history – as has happened with the imminent transfer of REHSC services from their current site in Sciennes Road to Little France. This year, we hope to work more closely with our NHS colleagues in order to identify material that, once transferred to us, can make the archive bigger and better for the future. I’ll be saying more about these images in the Centre for Research Collections blog, Untold Stories, later this year. 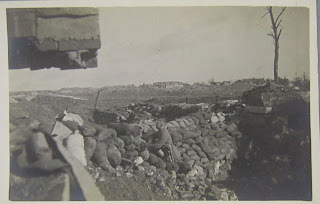 However, it’s important that archives are not just passive recipients of donations, but also seek out new additions to collections lest unique histories are lost. Dr Mike Barfoot, one of LHSA’s previous archivists, saw this very clearly, especially in the chance to collect material about Edinburgh’s fight against HIV. The combined efforts of the NHS, council bodies, charities, police and voluntary groups in our region to combat the spread of the virus and care for those affected had no precedent before or since (a fact which has been brought home to me by speaking to those involved in early patient care and HIV prevention). In collecting materials from individuals and organisations before they were lost, Mike saw a chance to build an unrivalled set of resources for future researchers. The determination to collect did not end when Mike retired, but was carried on by his successor, Laura Gould (who worked towards eleven of our HIV/AIDS collections being recognised by UNESCO in 2011) – and I hope that I can carry on this tradition of active collecting in my time here. This year, we’ve also received ten panels made for the Edinburgh Names Project at HIV and Hepatitis C charity, Waverley Care – these are textile collages meant to be put together as part of a large quilt to act as a memorial to those lost through AIDS-related illnesses. 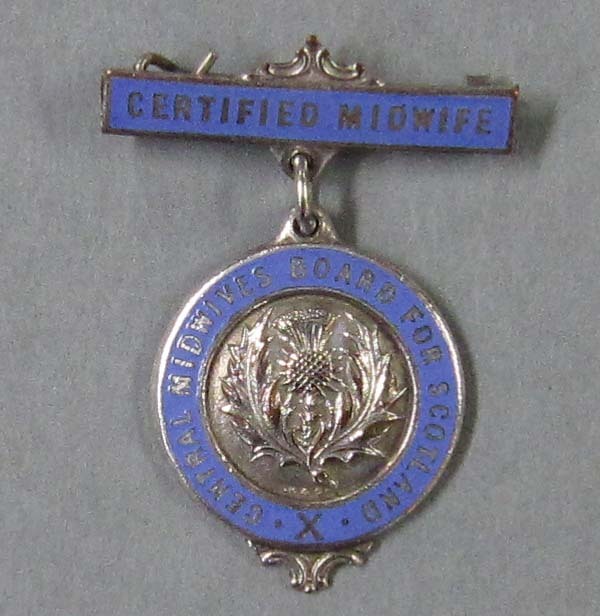 As we move into 2016, I’m already preparing to receive our first accession of the year. We never know what we are going to be contacted about next, but I’m sure that there will be more than a few surprises to bring to you. If you want to see what new material we've taken in over the last few years, you can find us on The National Archives' lists of accessions to repositories (where LHSA accessions from 2015 will soon be up to view). Happy new year from LHSA! But we’ve got 2016 to look forward to now, and lots in store for us already. 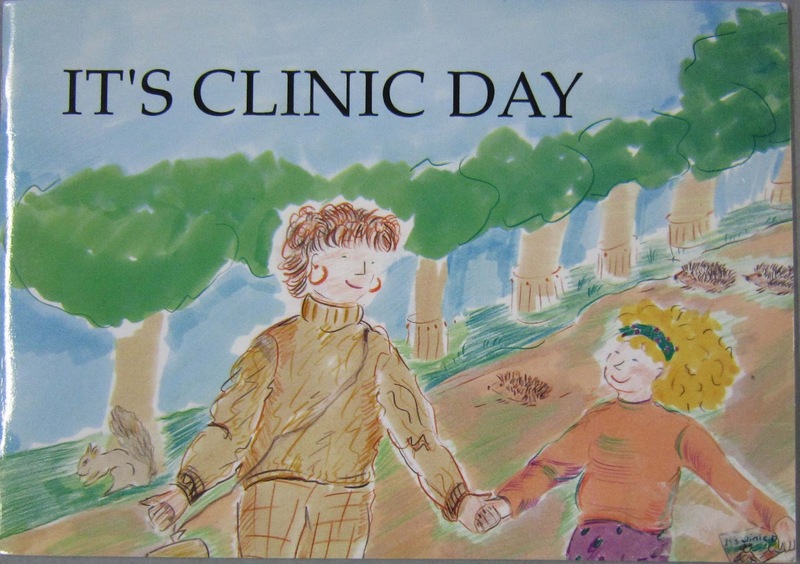 As well as our usual work helping others to access the LHSA collections, we’ll be collaborating with our NHS archivist colleagues across Scotland to organise a one-day symposium looking at the benefits of using archive material in art projects (and taking part in a couple of art projects ourselves for the redevelopment of the Royal Edinburgh Hospital and the new buildings at the Little France Royal Infirmary of Edinburgh site). We’ll also be showcasing a couple of our recent Wellcome Trust projects in an exhibition in the Main Library display wall later in the year, which will coincide with the completion of our Wellcome project to catalogue Norman Dott’s case notes that started back in 2012. We’re delighted to be taking part in the University’s Innovative Learning Week (ILW) in February where we have secured some funding from the ILW programme to create resources from archive material to entertain and educate 11 to 14 year olds in the Royal Edinburgh Hospital for Sick Children. And we’ll be working with colleagues from the Hospital to make sure those resources are just right! The rest of January is a particularly exciting time for us as we welcome two new members of staff. The first is a maternity cover post, to continue (and complete) the Dott case note cataloguing and the second is our Access Officer, who will focus on LHSA's user services work. More from both of them once they join us later this month, so watch this space!